The River's Edge Minnow Trap is a new trap that is made in China and sold by River's Edge products in St. Clair, Missouri. It was introduced in February, 2000. There are two models of the trap, one with five funnels and one with three. The five funnel trap was produced first and about 1200 of them were made. 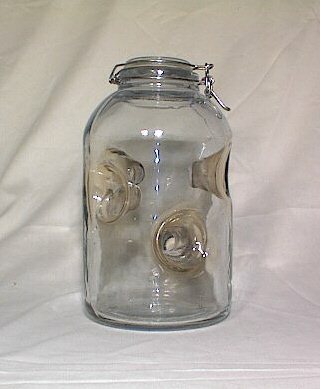 The three funnel trap is the newer model jar. Other pictures coming soon.